Together, we will journey into the light and shadow of what it means to be you. Together, under the full light of Mama Moon and surrounded by your Star*Seeded Sisterhood, you will be gifted a space to unveil your unique authentic expression. Together, we will gather in richly intentional ceremony to share, dance, play, sing, and laugh. Together, we will travel mystical fae lands to play with our self perception of light and shadow. Using dance, costume, and photography as our medium, we will delve deep into the undiscovered country of ourselves with, Lady Rainbow, Faerie Godmother, as our trusty guide. Together, we will discover our own good medicine by creating magical art that reflects the story of your layered self. Wild Rose, Medicine Woman will inspire our creative expression to be unleashed in surprising and unexpected ways. Together, we will surrender ourselves to the melodic vocals of Bonnie Paine of Elephant Revival and Mackenzie Page of Gipsy Moon as they teach us sacred songs of ancient sisterhood to let our inner song birds free! Plus more secret gifts & surprises that we are so excited to shower you with! 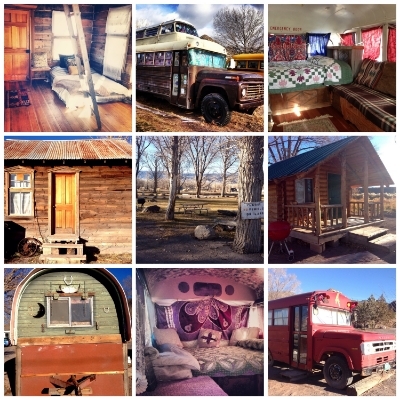 *Mystical Solitude: $350 - Be the Queen in your very own restored Hippie Bus or Gypsy Wagon* An experience like none other. Decorated in a funky boho chic style, your accommodation has comfortable mattress and fresh, clean linens. Just the way you like it. Share a common bathhouse with warm showers and flushing toilets that is located within steps of your door. *Dark Side of the Moon: $300 - Enjoy a room in our Mars Guesthouse and Gallery. A funky 1970's trailer, revitalized with Mystic flair! The Mars features it's own private bathrooms, kitchen and common room. *Share The Love: $275 - It's so fun to share! Especially when it's a Mystical Hippie Bus or Authentic Pioneer Cabin. Bring a friend or meet someone new. Share a common bathhouse with warm showers and flushing toilets that is located within a short walk from your door. *All Natural: $220 - Do it the natural way. Whether you pull up to the Mystic RV row with electrical hook ups, pitch a tent, or hang a hammock under the stars, this is the way to truly immerse yourself in the experience. Common bathhouse available within steps of campground and RV park. Timeless, unique, and enchanting, Ms. Bonnie Paine will steal your heart. She's the type of gal you want around in your most tender moments as she creates a magical presence wherever she goes. Her positivity is portrayed through the harmonic motion of her haunting voice, the rhythmic sensibility of her fingers and the grace of her words. Bonnie Paine from Elephant Revival w Acorn Project @ Mystic Hot Springs ~ What's That ~ VFG!!! 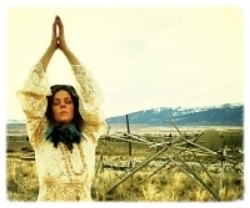 Bonnie Paine from Elephant Revival Solo @ Mystic Hot Springs ~ Drop VFG! Born and raised in the West, Mackenzie Page embodies it's adventurous spirit through her surreal art, fresh music, and deep love of nature. She brings texture and depth to her Colorado-based band, Gipsy Moon, with her poetry and sultry voice which leaves one aching for more.